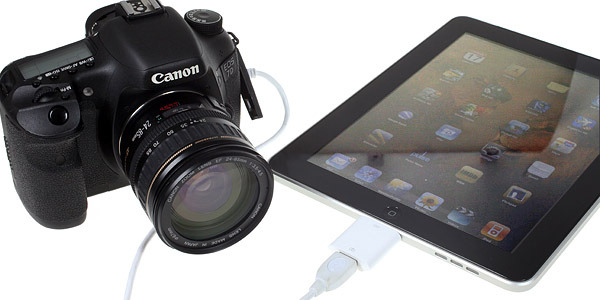 The Apple iPad camera connection kit consists of a USB adapter and a SD card reader. They both allow you only to transfer data TO the iPad and not offload data FROM it. Another thing you may be interested to know is the accessory is not compatible with any iPhones generation, it only works for the iPad. No surprises so far, all that was to be expected. Now while you may hook battery powered devices to the USB port – stuff like a digital camera or even an iPhone (it downloads the iPhone photos and videos to the iPad), the nice thing about it is it also has USB host functionality so you can connect non-powered devices such as a plain card reader. In my case I used one to offload a CompactFlash card to the iPad. The second piece of the kit is the SD card reader – it does what it says, no fancy stuff. Everything works exactly as advertised so I was pretty pleased with the kit right from the very start. Unfortunately, when I started my first transfers, I was in for the biggest disappointment. The transfer speed is really slow. Offloading a full ultra-fast 8GB 600x CF card to the iPad took some good 25-26 minutes! On a PC the same content took only 5-6 minutes to download. I experienced the same transfer speed both through my CF reader and with direct connection of the Canon 7D. The same held true when I tried copying the same content from a SD card using the card reader supplied in the kit. Now that’s a shame, it seems the only bottleneck here is the iPad itself. I really hope Apple can do something about it in the upcoming iOS 4 update. When you connect the iPad USB connection adapter and plug the camera, the iPad automatically opens the photo application, displaying the content on your camera, ordered by date. You can either import All images or select individual ones with a single tap. Once they are downloaded, you are prompted to either erase them or leave them on the device. You should also know that when you browse your camera memory next time, the images you’ve already downloaded will have a green check mark so you’ll know where you’ve left. The iPad organizes your downloaded photos in individual Events marked with the date you’ve downloaded them. If you’ve got RAW + JPEG photos on your camera, it will display them as one image. A serious drawback in the file management is that you cannot delete an event – instead you’d have to mark for deletion all individual photos inside it. I’ve tested my fast tapping skills and managed to mark 343 files in 150 seconds. Video clips are also organized in those same events but surprisingly VGA video clips from our Canon 5D Mark II cannot be played directly on the iPad, despite the fact they are recorded in the MOV file container with H.264 codec. Once you’ve downloaded your images, previewing them is flawless and fast – even for RAW files. It seems however the iPad achieves that by creating lower-resolution previews of the images. They still look rather good though. And if you need to email an image, the iPad sends the full-res copy. I managed to transfer even XviD .avi files via the SD card reader though you can’t play them on the iPad, you can only store them. Unfortunately (but not surprisingly) MP3 files cannot be uploaded with the connection kit. As usual, Apple gear interacts clumsy with computers running Windows. Getting all the content from the iPad is easy enough – just a matter of copy and paste. But once you’ve copied them to the computer, you can’t simply delete them from within the Windows environment, you can only do it from the iPad. Apple also doesn’t say a word which RAW files are supported by the image browser. I’ve successfully tested Canon (.CR2) and Nikon RAW (.NEF) files, while the Sigma .X3F RAW file cannot be recognized and more importantly – cannot be downloaded. As far as I know, Olympus RAW files are OK too. So if have experience with other cameras, please let us know in the comments. So that’s about it. The Apple iPad is a great way to browse and even show your photos. The iPad connection kit is awkward but it does the job done. I would have preferred a built-in USB port or card reader, but that’s not the Apple way of doing things. The only serious limitation right now is the slow transfer speed, and I really hope Apple fixes that (if it’s fixable at all).